Wow, thank you everyone for your encouragement on my rotation and my wip basket! I'm so glad you all like the idea! :) Well, I did work on "With My Needle" as scheduled yesterday. I got a lot of the girl's dress stitched. I'm happy with the progress I made. 40 ct. Light Examplar by Lakeside Linens with DMC Threads (1 over 2). 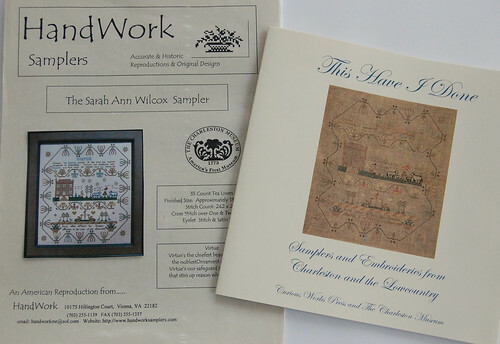 Sarah Ann Wilcox chart and a book about Charleston Samplers. The original of the sampler pattern I got is on the cover of the book. When I got home I also had some mail waiting for me. I fell in love with these two samplers after seeing them in Tanya's (The Scarlett House) album. 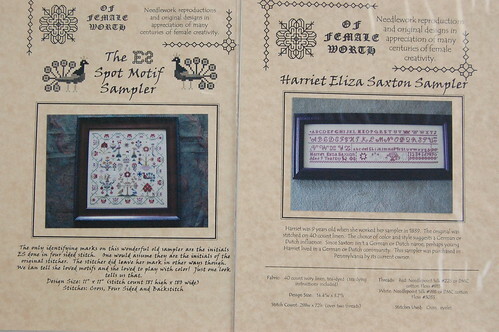 Of Female Worth "ES Spot Sampler" and "Harriet Eliza Saxton Sampler"
Well, today is "HoHRH" day. I already started stitching it a little - the 36 seems so big after working on 40 ct. all week! :) Well, not much else - Write soon! Your stitching is all looking lovely, little bits revealed each day on the rotations. I love what you bought at the Museum. Do you know if they can be purchased online? I have been Tanya's site too and really liked the the samplers she has stitched (and is stitching). I have my eye on the ES Spot Motif. *sigh* I figure if I can't at least stitch as much/as fast, at least I can have favourites to dream about! Only you could turn a trip to the Museum into a stash purchase. :) Looks like your sampler wall will be filled with plenty of finishes in the future. WMN is looking terrific. I love this design. Love the colors in this one! The rotations are fun to follow. I would never be able to stick to it, good for you! Your rotation seems to b working out well. Your progress pic is great. Your new stash looks wonderful. Enjoy! 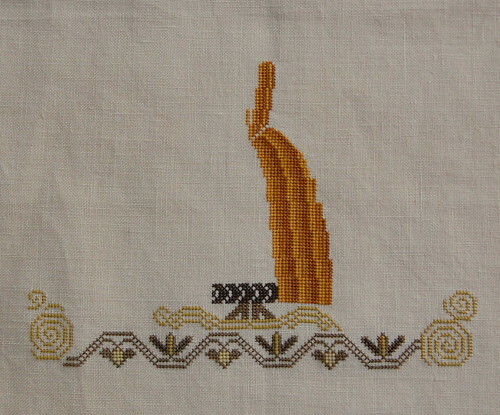 What beautiful stitching. Great finds at the museum. Looks like you are well on your way to having a sampler wall of your own. The colours in With my Needle are so scrummy. This is one on my list for this year so hope I can get time to stitch it. Great progress. With My Needle is looking lovely, the colours are beautiful! I love the ES Spot Sampler too, where did you get yours from? Wow, your progress on With My Needle was really good! Congratulations on your finds at the museum. Beautiful progress, Nicole, and what lovely finds at the Charleston museum! With My Needle looks great! Your wip is so pretty:) and I love your new stash!! How awesome to find patterns in the museum!